(Newser) – If you’re planning on taking a cruise, hopefully your ship won’t travel through the “great Atlantic garbage patch” that covers thousands of square miles between Bermuda and the Azores islands. The plastic debris is so small that some pieces are almost invisible, and the floating trash heap—pushed together by currents—is difficult to see from the surface, the AP reports…but it’s still enough to make you queasy. 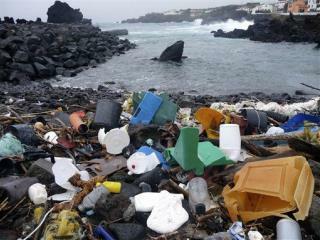 The Pacific Ocean has its own garbage patch between Hawaii and California. Two groups of scientists discovered its Atlantic counterpart, which is harmful for fish who mistake the plastic for plankton and eat it. One researcher describes taking water samples that came up full of plastic, including a plastic bucket with a Trigger fish trapped inside. The worst part: There’s no feasible way to clean it up, so prevention may be the only option, researchers say. How is it that they can get every last little fish (moving and migrating) out of the sea, but they can't get that plastic (just floating on the spot) cleaned up... I think by 'no feasible way' they meant 'no profitable way'. One thing people don't realize or don't care about -- the cruise lines have a dirty little secret. They toss all their bags of garbage over the side instead of transporting them to disposal sites on land where they can mostly be recycled or composted.